A baby dolphin which was rescued by members of the public after becoming stranded with its mother in Dundee has died, sea life experts believe. The calf got stuck at Broughty Ferry on 11 February but was refloated by two passing builders. Wildlife rescuers then helped its mother. 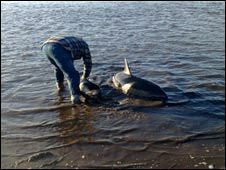 However, a calf was found in the Tay off Riverside Drive on 27 February and was taken away for examination. Animal medics now believe it is "highly likely" that it was the same calf. The calf was a common dolphin, which despite its name is rarely seen near the shore of the east coast of Scotland. An examination found that it had several small pieces of wood in its stomach, suggesting it would have been hungry and eating whatever it could. Elaine Roft, a British Divers Marine Life medic, said: "This one was dependent on its mother and it has strayed away from mum, or mum's sensed that it's been ill and she's left it. "They're learning to feed, so it would have picked up anything it could've. "It should still have been on its mother's milk so hasn't really learned to hunt for fish or anything, which is quite sad." Ms Roft warned people not to try to refloat stranded whales or dolphins themselves, but to phone for expert help and advice. She added that, although it did not appear to be a factor in this case, it was especially important not to get water into the blow hole as the animal could drown.